Is there anything better than a grilled cheese sandwich? How about a ham and pickle grilled cheese sandwich? I love a good grilled cheese sandwich. But I mean, who doesn't? Ooey gooey cheese and buttery toasted bread ....yum. I also love mustard, dill pickles, and ham, so why not throw them together? This is one of those super quick and easy recipes so you can have lunch in no time. 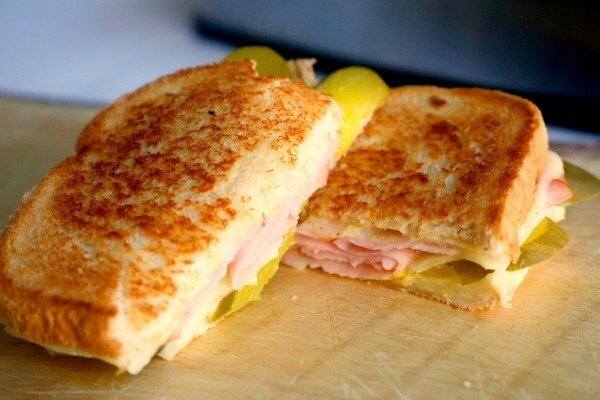 And ham and pickle grilled cheese sandwiches are great for serving at casual parties too. Butter one side of each slice of bread and spread mustard on the other side. Heat a skillet to medium high. Place one slice of bread butter side down into the skillet. Top the slice of bread with cheese, ham, more cheese, pickles, more cheese and then the other slice of bread. Turn the sandwich over to toast the second slice of bread.